Michele and I have always been captivated by the scenery along the Amalfi Coast and especially the views from Sorrento. 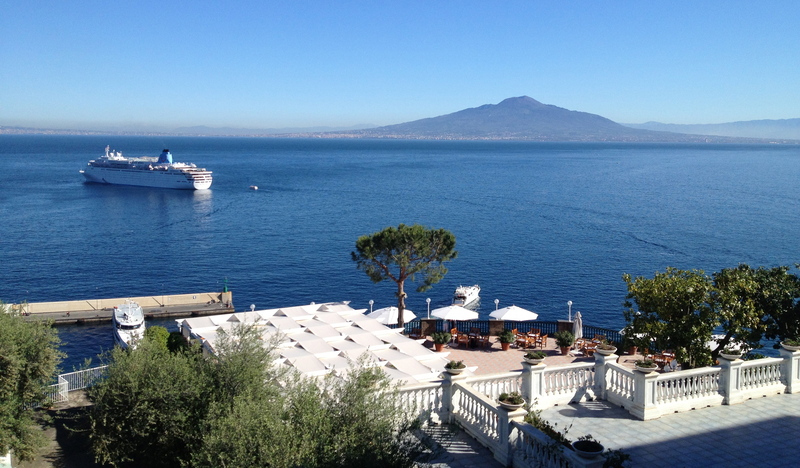 We decided to return to Sorrento again this year and rent an apartment with just such a view. We found an apartment with a terrace and a fantastic view of Mount Vesuvius and the surrounding area. The cruise ships anchored right below the apartment, and at night so did the fireworks barge. It looked like a private fireworks display just for us. It was quite a sight! The apartment did not have WiFi so we had breakfast in the morning and drinks at night at a cafè/bar called the Square and read our e-mail. The first night in Sorrento we went for dinner to a restaurant called ReFood. There was a big display of fresh fish at the entrance that looked very appealing, though most of the tourists in the restaurant were eating steak. Not a great idea. We went for the fish and vegetable dishes which were very good. 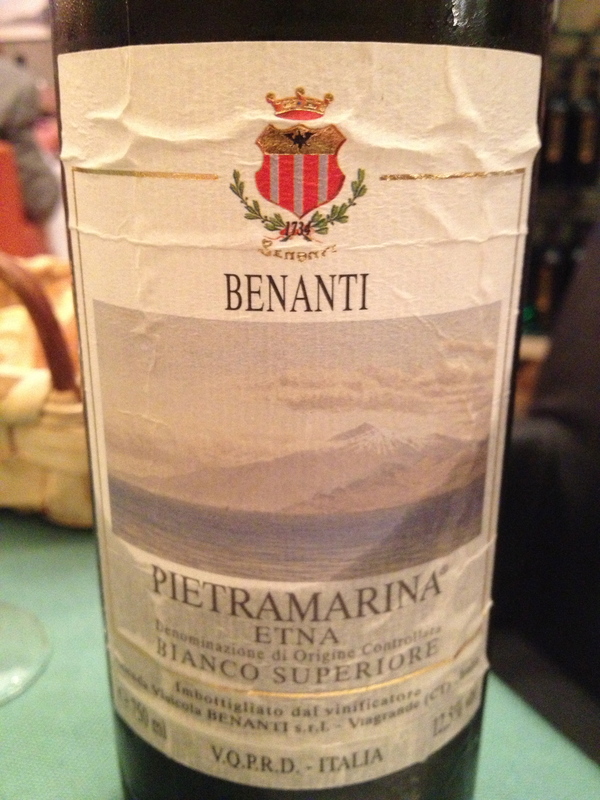 I ordered an Etna Bianco Superiore 2006 Pietramarina from Benanti made from 100% Caracanti. I had the grilled calamari and Michele had pasta with zucchini and cheese. Michele enjoys the zucchini in Italy because the variety they grow is less watery and has more flavor than the kind grown here. One of the reasons we like to visit Sorrento is that it is easy to take the bus or the local train to visit surrounding towns and we don’t need to rent a car. One of our favorite places to go is to Restaurant Lo Stuzzchino, a scenic half hour bus ride from Sorrento in the town of Sant’Agata sui Due Golfi. 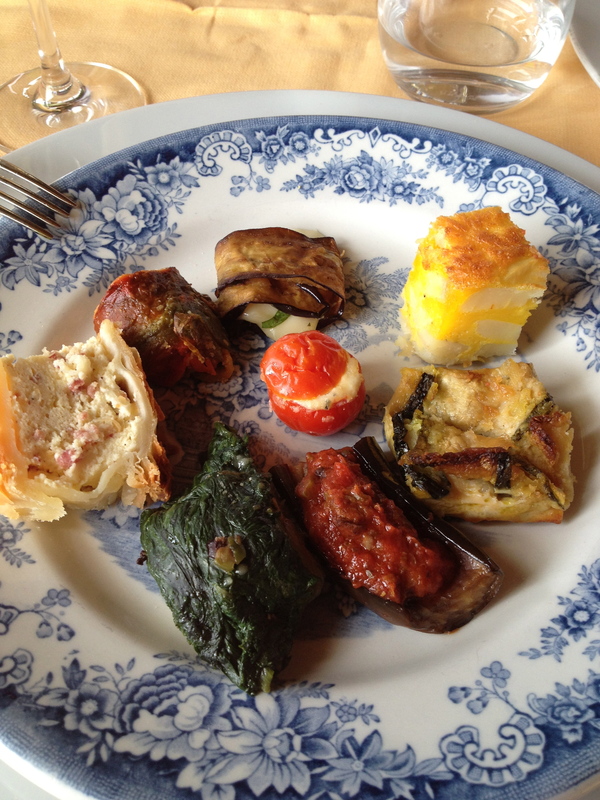 The owner of the restaurant is Domenico (Mimmo) De Gregorio who is also the sommelier. In the kitchen are his father Paolo, his mother Filomena and his wife Dora. Often when Mimmo was calling an order into the kitchen we would hear him holler “Mamma”. It is a true family restaurant. Last time we were there he introduced me to a wine made from the Caprettone grape from the area around Mount Vesuvius. I really liked this wine and asked if he still had any. He said he had a wine made from this grape but from a different producer. So he brought over a bottle of the 2011 Caprettone from Casa Barone. The food at Lo Stuzzichino is excellent. I ordered the ravioli again. There were six, two filled with cows milk ricotta, two from sheep and two from goat. Each pair had its own special sauce. Michele had pasta with potatoes and provolone cheese, a typical dish of the region, which she really enjoyed. 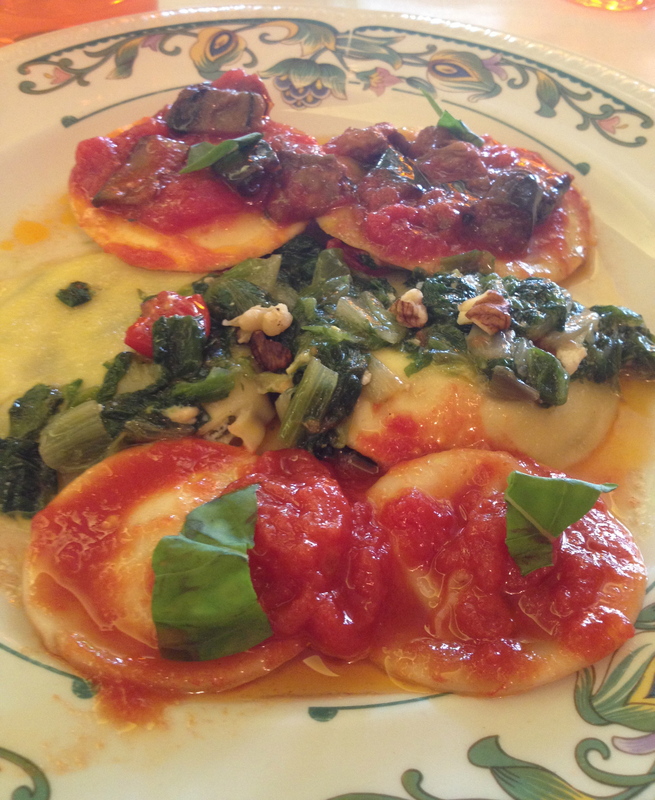 Antico Francischiello Restaurant is about 20 minutes by bus from Sorrento. It is a lovely restaurant with a great view of Capri and excellent traditional food so we returned again this year. There was a group of Japanese tourists in the restaurant when we arrived that were having a very good time eating ravioli followed by whole fish roasted in a salt crust. After lunch most of them ordered tea, which was served in teapots, and there were the small traditional teacups for them to drink from. The interior of the restaurant in very elegant and it is the only restaurant in the Sorrento area to be honored as one of the Historic Restaurants of Italy. We started with a vegetable antipasto, which we had enjoyed the last time we were here, and it was just as we remembered it. 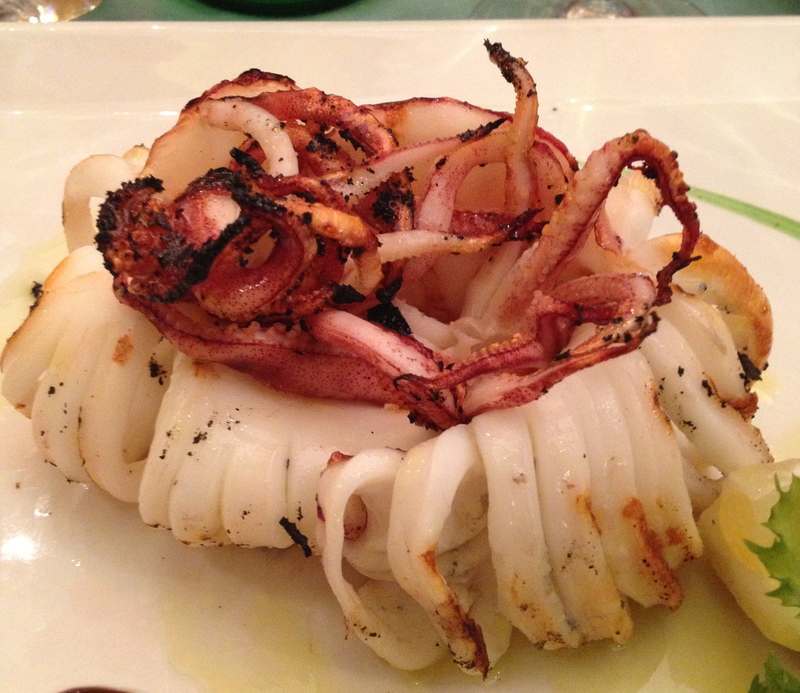 The dish that was our favorite was home made pasta with artichokes and squid, something we have never had before. They have a nice wine list but they were out of a number of things because they were waiting for a delivery. 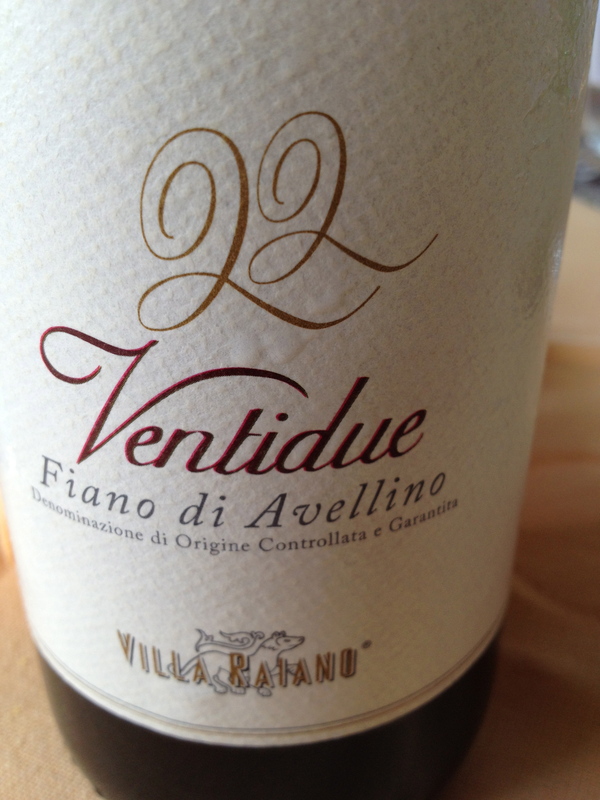 The owner recommended a Fiano di Avellino “Ventidui” 2011 from Villa Araiano and it was a good choice. We also returned to Torre del Saraceno, which is one of the most expensive restaurants in the area. The tasting menu that we ordered was 125 Euros a person but there were ten courses. My favorite course was the risotto topped with crispy seaweed. It is a very elegant restaurant and the service is excellent. The chef Gennaro Esposito travels a lot, and in March we saw him outside SD26 in NYC where he was doing a special dinner. 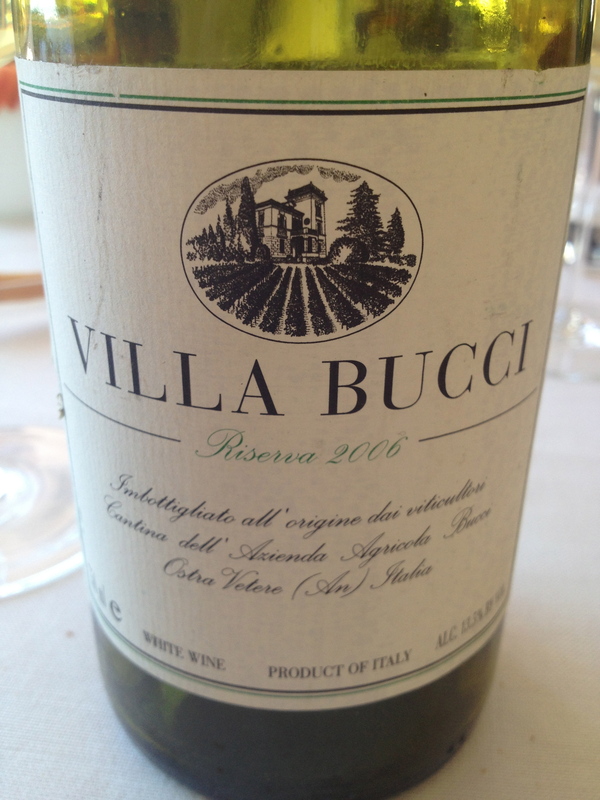 The wine I ordered was the Verdicchio dei Castelli di Jesi Classico Riserva 2006 Villa Bucci. 100% Verdicchio from vines which are 40 or 50 years old. This is a great white wine that I do not drink or write about often enough. It is aged for at least 1-1/2 years in Slavonian oak casks of 50 and 70 HL, very unusual for a white wine, plus in bottle for one year before release. It is very complex and elegant with hints of hazelnuts and honey and a touch of spice. 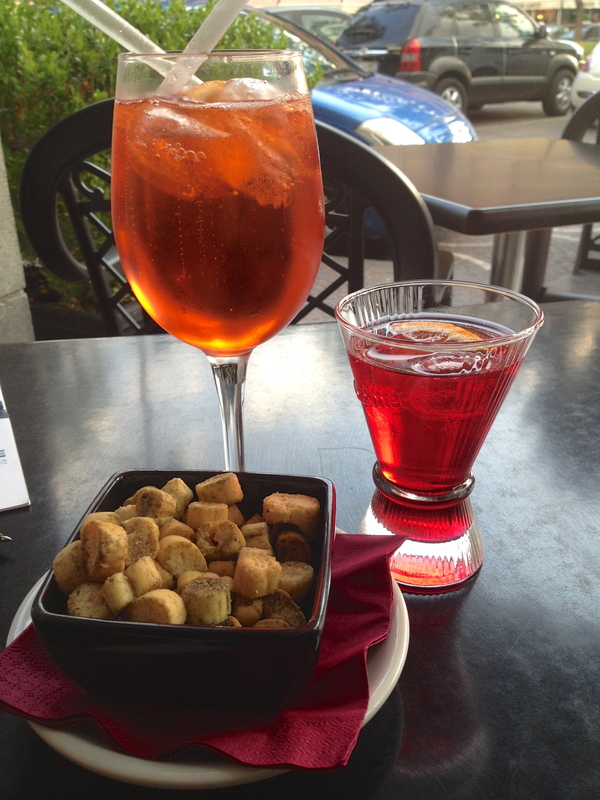 In Sorrento on the last day we returned to Restaurant Basilica. We sat outside in a corner table in the shade. I started with marinated white anchovies followed by pasta with scampi and tomatoes. 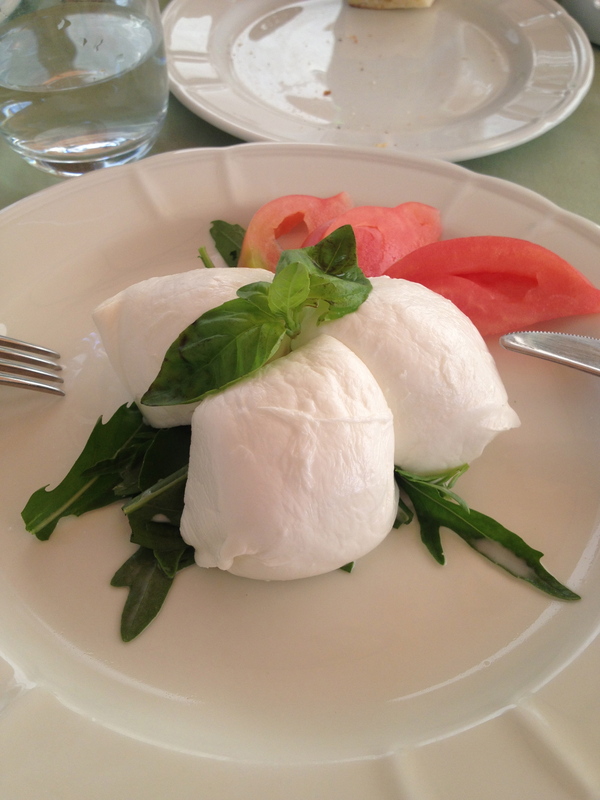 Michele ordered mozzarella di bufala and said it was excellent. It looked so good that I had to order it, too. It was delicious. 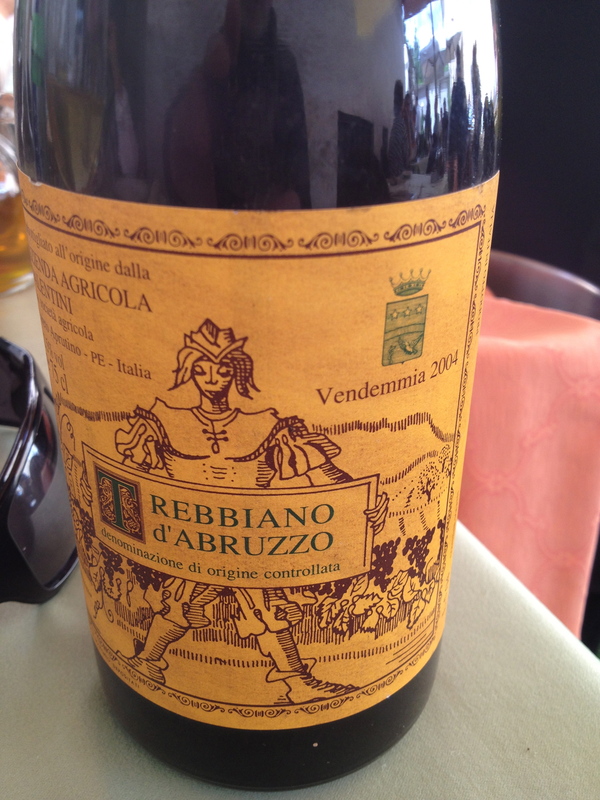 They had the 2004 Trebbiano d’Abruzzo from Eduardo Valentini, 100% Trebbiano d’Abruzzo. This is one of my favorite white wines and it was about $55, less than retail in NY so I had to drink it. The waiter could not get the cork out of the bottle so he had to push it in. Then he decanted the wine so there was no way to chill it. We drank it at room temperature and I enjoyed it so much that I will never chill this wine again.